I can’t really remember what my thoughts were at the time, but I do remember I started with some really difficult trick training exercises: touching a skippy ball, Spanish walk and a Classical bow. The skippy ball became a ‘target’ and it was really hard to change ‘touching’ the ball into pushing the ball. That didn’t take my pleasure away, though. The Classical bow was a coincidence and I was lucky to ‘capture’ that behaviour. I can’t recall how we got to a Spanish walk. I learned a lot about learning theory. I love to approach behaviour now as a matter of motivation: is the horse moving away from something or moving towards something? Is something else (than the training/trainer) more enticing? By looking at the motivation of the horse, I can now skip the whole ‘leadership’ and ‘dominance’ discussion in training. I learned to think out of the box and became more creative in training. I now have so many different ways to elicit behaviour and put it on cue. Shaping. I learned the power of shaping, a wonderful tool in training. The power of using a marker to mark (a step towards) the desired behaviour. Planning and the power of keeping a journal. I truly believe that I wouldn’t have grown so much as a horse trainer if it wasn’t for positive reinforcement. One of the best changes is that I learned to focus on what goes well instead of what went wrong! A change that bears fruit in all facets of my life! What are your most remarkable changes since you started using positive reinforcement for your horse? How did clicker training influenced you as trainer, horse lover or in your personal life? Here are some of my favourite tools for training horses and how they changed my training approach to a much more horse friendly way of training. The most powerful communication tool I ever had is the clicker. This simple device has had such a great impact on my life and on all of the horses I trained. It is the concept of the clicker that is important and changed my whole training approach and philosophy. It changed my focus to what I want from what I don’t want. By focusing on what I want, I get more of it. The click marks the exact behaviour and then a reward follows. In this way I can communicate very clearly to my horse what it is I want. He will try to do more of that behaviour and he will be rewarded again. I never reward him ‘for a good ride’ anymore, but I reward specifically for 1 perfect step of shoulder in. If my horse understands that it’s the shoulder in I reward for, he’ll give me more. When I ‘rewarded’ my horse after a ride by feeding him dinner it has never guaranteed me a better ride next time. He simply didn’t connect the food with the quality of the ride, he probably associated it with taking the saddle off. If the horse doesn’t have to be afraid of punishment or aversives, the chances improve that he will try more behaviours which makes it easier to teach him more and more things. It encourages the creativity of the horse. 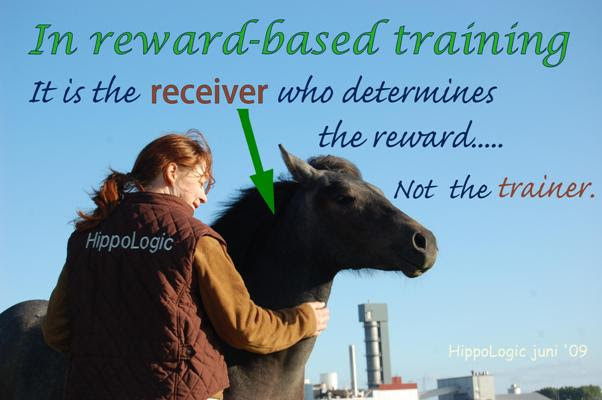 When I changed my focus from traditional training to working with rewards I was forced to think about the question ‘What is rewarding for my horse?’ If the reward is not reinforcing the behaviour you’re training it is useless as reward. This resulted in observing my horse with new eyes. I started to pay more attention to his preferences: what kind of exercises/training did he like best? What treats did he eat first if I gave him a choice? What was his favourite scratching spot? I also noticed other things about him, like who were his friends in the pasture and where he stood in the herd hierarchy. I learned a lot since I started focusing on rewards and my horses’ opinions about them. 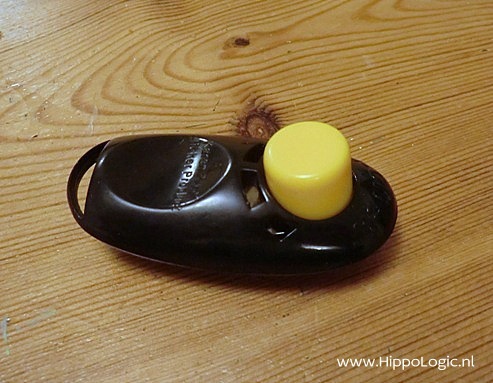 When I started using clicker training I trained with my pocket full of treats, but often I used a kitchen timer to make sure I didn’t over-train my horse. I used 5 minute training blocks with breaks in between. I had never used a break in my training before! I used to train and train and train. My horse improved, I changed my criteria, my horse improved, I raise my criteria and so on, until my horse didn’t improve anymore. That often resulted in ending our rides with some frustration for both of us. The timer made me much more aware of the improvements we made per session. Taking breaks also gave me the opportunity to reconsider my training approach if necessary. A break can also be a big reward, just a few minutes to relax. In the break my horse can decide what he wants to do. If I work at liberty the breaks I give my horse can give me valuable information. Does he stay with me, does he walk off? What is he going to do in the break? If he is heading for the door, it is a sign that he’s had enough. 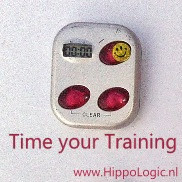 I still use a kitchen timer when I train new behaviours. ‘Less is more’ applies to training time. More training time does not necessarily result in better performance. What I really liked about the Natural Horsemanship method I followed in the late nineties, was the step-by-step program I bought. It was very practical because it described the horse behaviour in advance: I could expect this, this and this. Fan-tas-tic! I just had to follow the steps and boom! “Friendship” and “Partnership” where delivered. When things didn’t work out the way the book described you could look up “pitfalls” and read where you skipped a step and what you had to work on. Great. It worked. Best thing of all, I didn’t have to think for myself anymore. It was all in the levels. If it really didn’t work out “I was just not ready for the next level”. The biggest struggle when I started clicker training in the late nineties was that there was no “method”, no step-by-step program to follow and few people to turn to for advice. There were only a few rules to follow: pinpoint the wanted behaviour with a bridge signal and let the bridge always be followed by a reward. The receiver determines the reward. The only source of knowledge that I had in the late nineties was an Yahoo email group. It was in English and this is not my first language, so that was a huge threshold to turn to for questions and advice. I was lucky to learn from someone who had followed a course about training sea mammals with positive reinforcement and that I had studied Learning theory during my bachelors in Animal Management. This made it much easier for me to understand the whole science behind positive reinforcement. Not only did my clicker training journey come without a map and a clear road to follow, I had to learn to think outside the box. It was so completely different from all the things I had learned about horses in the previous 25 years and at the same time it made so much sense emotionally: looking forward to earning a reward versus avoiding an aversive. I am glad to see that there is so much information available for passionate horse owners and riders who like to start training their horses with rewards. There are books, clinics and also a lot of instructors and horse trainers who are available all over the world. It is still a minority but who knows what happens in a few more years. Internet is one of the blessings in spreading information these days.